What’s a pocket park? Exactly what it sounds like. A tiny park you can practically fit in your pocket it’s so darned small. This piece original ran on I Spy RVA. Check it out! The other day, as I scooted my way to work, zipping by Bryan Park and Kitchen 64, I longed to just keep going–the wind was light and there were a few cumulus puffs dotting the sky. At work, still thinking about the weather, I decided I’d eat lunch outdoors–and what better place than one of Richmond’s awesome pocket parks? 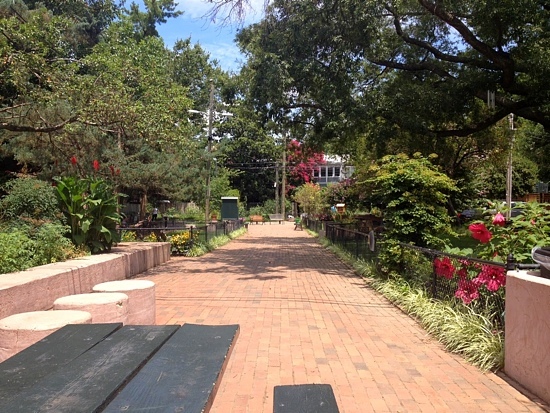 By now I’m sure most Richmonders have heard of these tucked-away gems, but if you haven’t–lend me your eyes–because these adorable micro-parks are a true treasure to behold. What’s a pocket park? Exactly what it sounds like. A tiny park that you can practically fit in your pocket it’s so darned small. For lunch, I chose what is probably my favorite: Scuffletown Park. It’s conveniently located in the alley across the street from Strawberry Street Market, where you can grab a sandwich or wrap to take to a shaded spot in the park. As I sat there, I decided to come back the following day to take a tour of The Fan’s pocket parks. 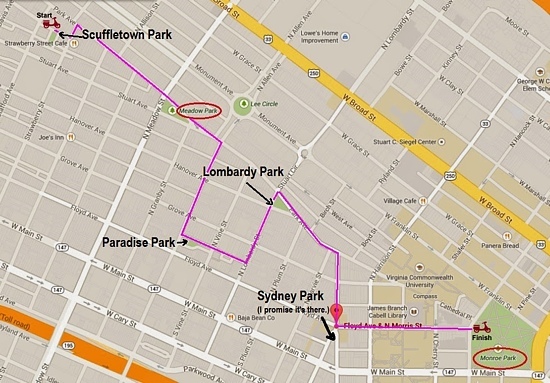 I laced up my chucks, hopped on my scoot, and was on my way to my first destination: Scuffletown–again! Scuffletown is full of spots to sit and enjoy the plush greenery that swallows you up as soon as you enter it. Brimming with flowers and plants, this park makes you feel like you’re in a secret garden…which you kind of are. There were quite a few other folks moseying around the park, reading books, or enjoying a snack while I was there. Super sweet note of appreciation and a Little Free Library–take a book, return a book! Scuffletown is one of the two parks on my list that are tucked away in an alley, where you’d miss it if you just drove down Strawberry Street. I have to park my scooter and walk behind the beautiful homes I could never afford to visit this teensy verdure. Fine by me, this park is totally worth parking for. A perfect picnic spot and oh-so-enticing menu options. The next park on my map was Meadow Park, nestled in the wedge of Park Avenue, Stuart Avenue, and Meadow Street. This park sits across the street from one of my all-time favorite Richmond food spots–Garnett’s Cafe, where a sandwich is so much more than a sandwich. Garnett’s is wise to its perfect proximity to Meadow Park: you can grab a to-go picnic basket (with blanket included) and grab some shade under a tree to enjoy lunch with your significant other or a few pals. Another Little Free Library and more dazzling, pricey homes that overlook this little park. Lucky dogs. This park is a good one, but far less hidden. I used to pass it every day on my way to work when I lived in the Maymont neighborhood, as would anyone else driving up Meadow towards Monument Ave. It too had a fairly impressive populace considering its pint-sized proportions; a guy strumming his guitar, a family walking their scruffy terrier, and many others were spread throughout this grassy wedge. Concrete shapes adorned with super cool art-doodles and silly words are what make this park worth a look. Next up: Paradise Park. Tucked in the alley between Grove Avenue and Floyd Avenue, this park is another hush-hush spot that’s easily over-looked if you didn’t know to stop and search for it. On the day I visited, it was mostly vacant, with only one other visitor quietly enjoying a sunny seat within the secluded play area. Paradise park is less greenery and more highly-decorated climbables. Every concrete block, or other geometric structure, is covered with whimsical paintings and bright colors. While certainly less botanical, this park boasts plenty for kids young and old to cherish. I got back on my scooter and sped to Lombardy Park, the next on my list. As soon as I walked into this park I felt, well, out of place. The park was definitely bustling, however every single patron had one thing that I was lacking: children. This park is best suited for those toting a kid or two. Though I was the only person without a child, no one looked at me funny or asked why the hell I was there. The sandy grounds of the park were scattered with various toys that are free for any youngster to play with, so if you have kids, this is a wonderful place to bring them. With a swing-set, more than a handful of trikes, and lots of kids running around there is no shortage of entertainment for the little ones. 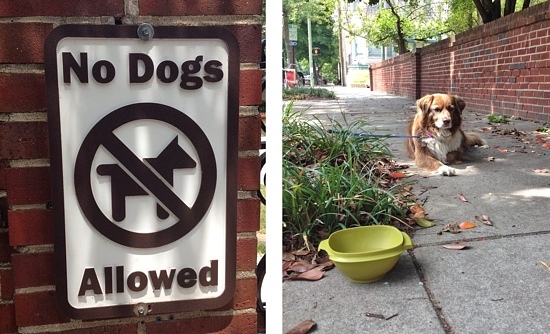 Unfortunately, Lombardy Park is not for your canine companions to enjoy. With all the little ones running around, I could see how the occasional forgotten turd would not be welcomed on these grounds. So if you’re planning to stop here while on a walk with your furry family member, consider bringing a bottle of water and bowl along like the park-goer above did for her pup. This guy seemed perfectly content to lie in the shade while his family enjoyed a little playtime. Hey, it has grass and benches so it counts as a park. Next, and last, on my map, Sydney Park is the smallest park of the day. While astoundingly wee, it’s right in Lamplighter’s newest backyard which makes this park the perfect place to sit for a spell while enjoying an iced coffee. Richmond’s pocket parks are truly something to behold. Each one as unique as the one before, and each one with its own special, magical something. If you haven’t visited these little gems, I urge you to do so, each is a treasure in it’s own right. Abby Waller has lived in Richmond most of her life. She adores the gritty city and through her blog ISpyRVA.com she attempts to capture its quirks and awesomeness.